Do you feel like home organization is a personal struggle for you? Here are 5 tips for getting organized and keeping it that way for years to come! Organization comes naturally to some of us, but to others getting organized can be an uphill battle. 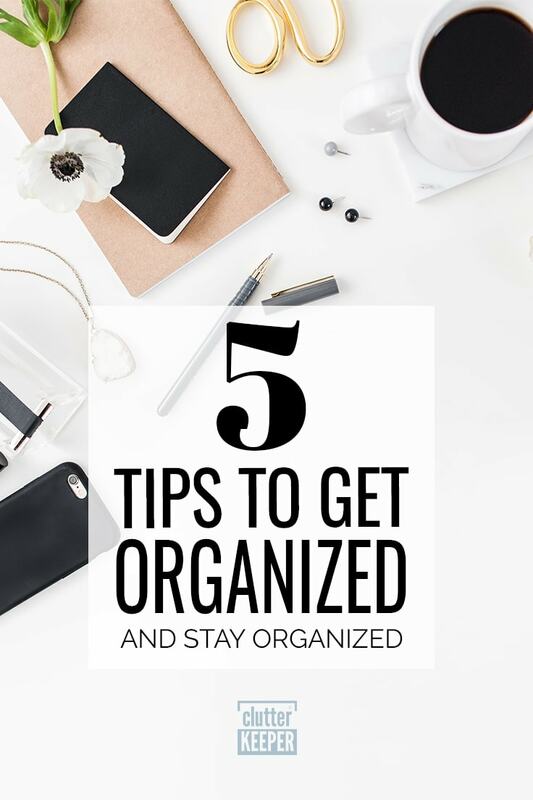 For those of us who have a harder time, here are 5 tips for getting organized! The very first thing you need to do when getting organized is to clean out all the unnecessary items. Take time to sort through everything and find where it really should be kept. Using clear storage bins can be helpful in the process. Why are clear storage bins the best for organizing? Because you can see into the container without having to open the lid. Within a few minutes, you can see if it has room for more items. When you use the bins, label them. There are reusable labels or you can make your own. And as you are sorting, consider this – if you don’t have a place for it, maybe you never needed it to start with! By sorting through everything you’ll have a better idea of how much stuff is in your home, and what categories they fall into. Anything you don’t use or don’t need anymore, donate! Just because it doesn’t have a place in your home doesn’t mean someone else couldn’t use it. Once everything is sorted, move on to the next tip. A label maker is an extremely valuable tool when organizing. You can label storage bins, individual items, anything you want to help get things back where they belong at the end of the day. The biggest struggle in getting organized is keeping up with it as items get used, and with labeling, you’ll have no problem getting things back where they belong! Once you have your sorted items and have your storage areas labeled and ready, get those things neatly filed away for good. In your sorting process, you may have found that you have a lot more papers than you thought you did. You’re not alone! Many families face the challenge of dealing with unwanted paper clutter. Solve this by using a scanner to digitize photos, documents, children’s art, or anything else you want to keep, but don’t need a physical copy of. Paper organization is much easier on a computer, and you can use as many folders and subfolders as you want without taking up space! Once you have everything digitized and organized the way you want it, don’t forget to back it all up on a portable external hard drive just in case. Many households have a single area that seems to never stay tidy and gets disorganized no matter how much time is spent on it. Typically these are areas of the house that people spend the most time in, like the living room or kitchen. Keep an eye on the areas of your home that need the most frequent reorganization and adjust your organization systems as you go. A good tip is to keep it simple in those areas, making it easy for everyone to clean up after themselves. Do you get lost after sorting, run out of ideas for storage, or otherwise get demotivated while organizing your home? Get inspired by others and check out pictures on Pinterest or other sites of organizational ideas and style options! Staying organized means knowing how things should be kept, and keeping up with it. Seeing visual goals can help you get rolling on your organization too! What is stuff guilt? Read on! Feeling guilty about purging things you no longer use or having a hard time giving them away? 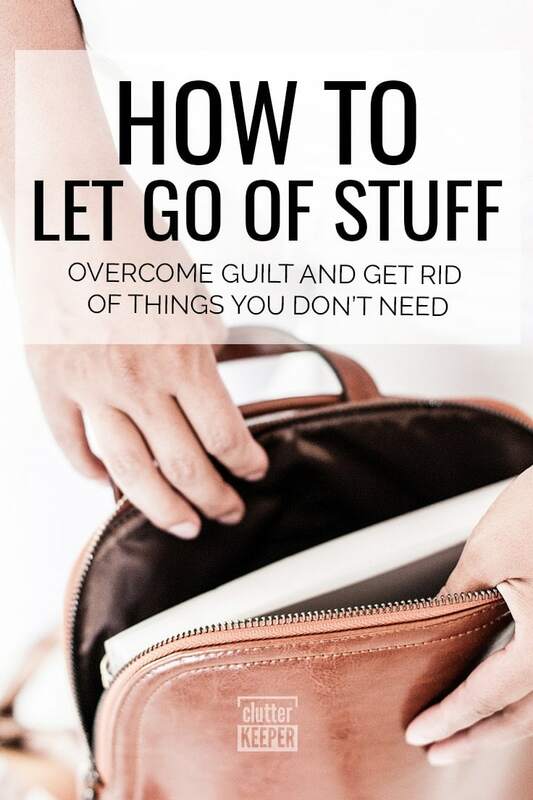 You need helpful tips for how to let go of your stuff guilt. What is stuff guilt? It’s that feeling you get when you know you need to get rid of things you don’t need or use, but just can’t do it. We all have our reasons for wanting to hold onto our belongings. When it comes to holding onto things we are no longer using, all of our fears, resistance, memories of that item can tend to keep us from letting go of things. For many of us, one of those feelings is guilt. The guilt of a gift that was well intended but never used. The guilt of giving away an expensive item that you don’t like. The guilt of letting go of the person you thought you would be if you used this item. This guilt is all too real, and today we are sharing with you how to let go of your stuff guilt. The first step to letting go of your stuff guilt is to understand why you have the guilt in the first place. Is it because a loved one gave you that item? Is this a family heirloom that you are reluctant to let go of? Where is your guilt stemming from? Understanding your guilt can not only help you let go of your stuff guilt but also prevent that guilt from creeping back after your item has been donated. Treasured items can be a difficult thing to part with, and sometimes donating those items just doesn’t feel as satisfying. Instead of just donating them to a random person, look for a new owner for your treasured items. Is there a family member who might love this item? A person in need who could use it? Look for a new owner personally before donating the items that are sentimental to you. If you are unsure about whether or not to get rid of an item, start by using the $20 or less rule. If you can repurchase the exact same item for $20 or less, then let it go! If you are even feeling guilty about it from that moment, then set aside $20 to purchase it with later if you need to. If you find out later you did need that item, take out the $20 and repurchase it. If it is a rare item that can’t be replaced, do a trial run without it first. If you are unsure about an item, do a trial run without it before you actually get rid of that item. Put it in a box and seal it shut. Put a date on the box, and when that date arrives, if you haven’t opened the box, you know you can safely donate it without guilt. When an item is staring us in the face we tend to have a more difficult time parting ways with it. However, when you do a trial run, you can be certain you won’t need it. Stuff guilt is a very real thing that affects so many of us, especially when we are trying to purge our items. Don’t let the guilt of the things you’ve outgrown keep you from living with less. Organization is an important part of a tidy home, and it helps keep your life in order too. The hardest part is getting started, but once you see the benefits you’ll never want to stop. By following these 5 tips for getting organized and overcoming the guilt of letting go of stuff, you’ll be able to organize your home and keep it that way for years to come! Top 10 Places You’ll Find Clutter In Your Home – This is super helpful. It reassures you that you aren’t alone. Everyone struggles with these common areas of chaos. How to Keep Your Kids Organized – From chores to activities, teaching your kids to be organized will help your sanity (and help the house run smoothly). 5 Things to Do With Your Unwanted Clothes – This article goes beyond just donating clothes. These are ideas that can actually make you money too!